Brian's challenge to us was to drink his flat dry. Unfortunately my father had taken to buying in bulk whenever he saw a bargain or he could get stocks delivered. The stock highlights included over 4 litres of Gin, over 3 cases of red wine and plenty of beer, whiskies etc. The number of drivers was managed well and so we had a good go before sending all home with a bottle or 2 to raise a glass to Brian with. 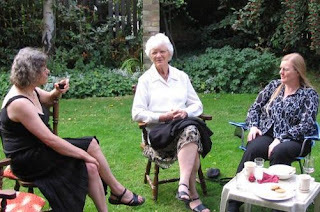 Brian's Gardeners, Jane and Helene. Chris, Rob, Jacqui & Pat. We are so sorry to hear about Brian. I can't believe that it was only last Friday we were talking of your holiday plans. He was looking forward to the change of scenery and company. ... Despite the doctor's mutterings Brian still enjoyed a satidfying smoke and his timely tipple. If fact we can picture he and Uncle Tedup there raising thier glasses in a companionable cloud. We do hope Brian had a peaceful end. He had such a zest for life and lived it to the full. We will raise a glass or two to his memory as we will not be able to join you. Message sent to the flat and read out at 'the Wake'. 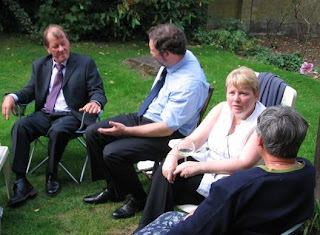 To our family and friends gathered for recollections of Brian on Wednesday (5th Sept 2007). We'll be remembering too and raise our glasses as he would ask of us all.